The Talmud teaches that those who don’t mourn ancient Jerusalem’s destruction will not merit rejoicing with her at her redemption. I have always understood this statement to mean that we can only truly appreciate the greatest joys in our lives if we have truly engaged with the sorrows in our lives. As the two extremes seemingly travel together within us, our saddest moments are buoyed by the knowledge that we have known—and will know again—pure joy. Similarly, our happiest moments are tinged with the knowledge that such joy can’t last forever, and that we will no doubt come to know sadness again. One of the ancient rituals of the holiday of Sukkot is the celebration of water drawing and libations that took place in the time of the Holy Temple. The Talmud describes this ceremony as the epitome of joy, as water would be drawn from a well and poured over the sacrificial altar. 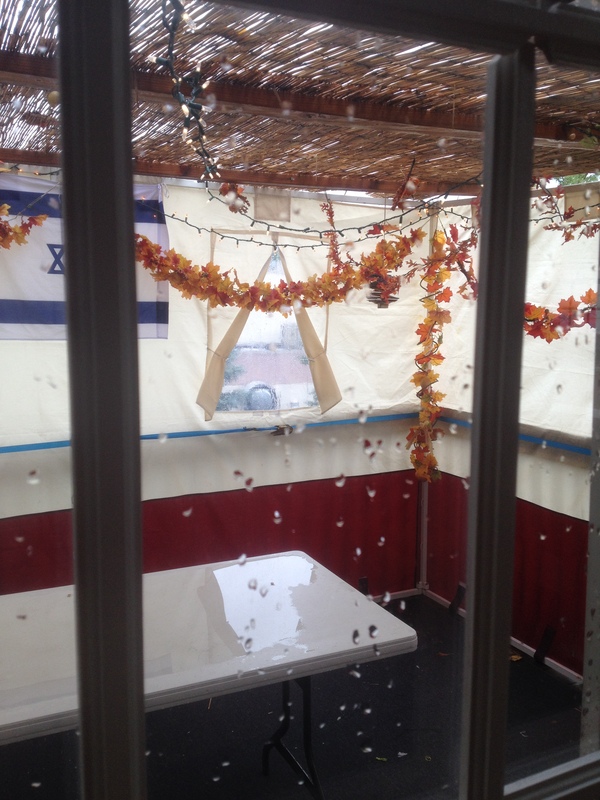 As the rains fall today, on this third day of the holiday, we have the luxury of moving indoors; but our prayers for rain at this time despite wanting to be outside in the sukkah underline this sense of anxiety with which we live. We don’t control the weather—no matter what Rabbi Drill tells you about her powers—and we are dependent on a force beyond our control to bring just enough rain to be a blessing, a source of sustenance and joy. The same source of that joy, however, can also be a source of destruction and sadness. When it is time to draw from the well, there is no guarantee the well will be filled. We want to find the well filled when we need it, but not at the expense of the joy that is meant to accompany this holiday. I liken this well to a well that exists within each of us. That well holds all our love. It is filled by how much love we give, and by how much we allow ourselves to be loved. In our times of greatest celebration, that love is easily drawn and poured out atop our offerings of joy. And in times of our greatest sadness, that love is similarly drawn up from the well, to be poured atop our altar of tears. Only those of us who have drawn from the well in sadness can truly understand what it means to draw from the well in joy. And only those of us who have known such complete joy as to cry in happiness can fully appreciate the profound nature of our loss. To paraphrase a line from the movie Parenthood (the original with Steve Martin, not the TV series), we must choose whether we want our lives to run like a rollercoaster, with all its exhilarating highs and frightening lows, or like a merry-go-round, never really getting anywhere. Jewish living invites us to ride the rollercoaster–to be exhilarated and frightened, joyful and sorrowful, in the same breath. May we be comforted in knowing that the feeling in the pit of our stomach is simply a wellspring of love. Thank you to so many congregants, family members and friends who have responded in phone calls and writing to my Rosh Hashana sermon, anchored by Dr.Atul Gawande’s deeply affecting book, Being Mortal. In the days since Rosh Hashana, many of you have shared your stories, struggles and experiences of deep understanding. And many more of you have asked for assistance with beginning the difficult conversations about what our lives mean to us. On Rosh Hashana I asked us to consider how we want to face the end of our lives if we are blessed with the opportunity to have choices. I asked us whether we know the true choices of those we love. I share here a synopsis of my teaching and the links to the resources that I mentioned in the sermon. 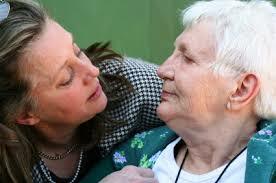 In the experience of family members dealing with the inevitable dying of an elderly or seriously ill loved one, there comes a time when they recognize at some level that they are up against the unfixable. If they are blessed or wise or very well versed in matters of life and death, however, the unfixable does not have to be the unmanageable. 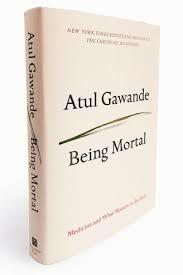 Gawande’s transformative book is filled with studies and anecdotal evidence about the astounding intersection of medicine and dying in modern society. He writes that scientific advances have turned the processes of aging and dying into medical experiences, matters to be managed by health care professionals. Gawande believes that the medical world has proved alarmingly unprepared for helping people understand death. His book is filled with stories of heartbreak and loss and dying. But each story is most of all about triumph – triumph due to the recognition that we are all mortal. Being mortal means that we are not immortal. It means that all of us will one day die. As I prepared my sermon, believe me, I understood that mortality can be a treacherous subject. Listeners might be alarmed at my talking about the inevitability of decline and death. No matter how carefully I framed my words; for some, the topic would raise the specter of a society ready to sacrifice its sick and aged. But here are Gawande’s words that encouraged me to take up this topic despite the risks of discomfort or fear. He wrote: What if the sick and aged are already being sacrificed – victims of our refusal to accept the inexorability of our life cycle? And what if there are better approaches, right in front of our eyes, waiting to be recognized? Gawande’s book, to me, is a very Jewish conversation. Rebbe Nachman of Bratzlav wrote: Kol haolam kulo gesher tzar m’od, v’ha-ikar lo l’fached klal. “All of this world is just a very narrow bridge and the main thing, the essence, is not to be afraid at all.” Perhaps that narrow bridge is meant to teach that between birth and death, there is just a narrow passage, like grass that springs up in the morning but is gone by night and no one can tell where it grew. That bridge is the human condition. We move from birth toward death every moment. So – do not be afraid. Rather, walk confidently and solidly and powerfully on that bridge. Without fear, we can enjoy the view. Do not be afraid at all. What is required is courage. We require courage to acknowledge what we all know to be true, and then, most daunting of all, the courage to act on the truth we find. The wisest course is so frequently unclear. In conversations about mortality, it is important to decide whether our fears or our hopes are what should matter most. There is no right or wrong way for everyone. 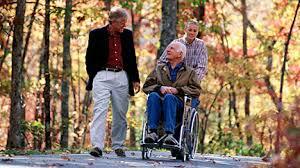 The only correct way of facing aging, illness and dying is the way required by each individual in his or her unique situation. The difference between a good death and a hard death hinges on whether someone’s wishes were expressed and respected, whether they’d had a conversation about how they wanted to live toward the end. While 90% of Americans think it’s important to have such conversations, only 30% of us have actually had these conversations. We can change that by bringing the people we love to the kitchen table to have the conversation. And we can do this before there is a crisis rather than in the I.C.U. So what stops us? We don’t talk with our loved ones, we don’t talk about our own desires because “it’s too soon.” But it’s always too soon … until it’s too late. Throughout the liturgy of this High Holy Day season, we Jews practice thinking about our mortality. Who shall live and who shall die? On Yom Kippur, we will abstain from food and drink, playacting a mini-death in order to understand the necessity of teshuva, repentance. Our rabbis knew what they were doing, insisting that the theology of each new year must address the meaning of our lives which can only be done with an acknowledgment of the finitude of these lives of ours. The question remains: How do we have these conversations? If you choose to begin the conversation with your doctor, consider the Dear Doctor letter devised by a team led by Dr. VJ Periyakoil, Director of Palliative Care Education at Stanford University School of Medicine. Here is Dr. Periyakoil’s letter that can help in this conversation. I advocate that the conversation also take place in your families and in your circles of intimate friendships. Conversation Starter Kit created by The Conversation Project avoids being a technical medical checklist for the dying in favor of a careful discussion guide for the living. The kit asks what matters to you, NOT what’s the matter with you. http://theconversationproject.org/starter-kit/get-ready/. Rabbi Scheff and I are available to you to help begin the conversations. Contact us at Rabbi.Drill@theojc.org or Rabbi.Scheff@theojc.org. Be in touch if you would like to see the full text of my Rosh Hashana sermon. If Rabbi Nachman was correct, and all the world is just a narrow bridge, I pray that all of us are able to make meaning of our short walk across it. It begins with acknowledging the bridge, not to diminish life, but rather to value it. As far as I am concerned, reading a sermon in print—especially a high holiday sermon—is nowhere near as effective as hearing a message in a room filled with community brothers and sisters. That being said, I am told that people often want to hear the crux of the messages if they could not be present for whatever reason. So hear is the crux, and just the crux (minus the lead in, the joke, and the sources in support thereof, available upon request)! WE HAVE BECOME FAR TOO COMFORTABLE, BORDERING ON APATHETIC, AS FAR AS OUR JEWISH IDENTITIES ARE CONCERNED! In May, the mayor of Rehovot cancels a bar mitzvah celebration for children with disabilities because it is scheduled to take place in a Masorti (Israeli Conservative) synagogue. After Israeli President Rivlin reschedules the service to take place in his own residence, he cancels the service. On Shavuot, the holiday on which we celebrate the giving of the Torah, Tzohar (an Israeli organization of supposedly more open-minded Orthodox rabbis) cancels its invitation to Masorti and Reform rabbis to participate in the holiday’s all-night study session. The rabbis are subsequently re-invited, but are placed in a separate space from the rest of the program. In June, the Chief Rabbinate of Israel tries to force the retirement of Rabbi Shlomo Riskin, Chief Rabbi of Efrat. The reason given is his age, but his willingness to train women to be Jewish legal experts and his willingness to engage in interfaith dialogue were the more plausible motivating factors. In July, I am invited to participate in my cousin’s wedding ceremony (in my sister’s back yard), to be conducted by a Tzohar rabbi. Originally I was to be the officiant, but my cousin’s bride’s family pressured the couple to use an Orthodox rabbi whose wedding could be registered with the state as a religious wedding. The officiant calls me to the huppah as “Mister” Craig Scheff. I feel the sting on my cheek as if someone publicly slapped me. In that moment, I want to disappear. I am not a rabbi, and as far as I am concerned, in the eyes of the State of Israel, I am not a Jew. Israel is my story. I was a slave. I came out of Egypt. I stood at Sinai. And so did you! We were all there! But someone, in the unlikeliest of places and with disproportionate power and influence, is attacking our identities, telling us were not there! Ironically, the land of Israel was never guaranteed as a possession to our ancestors. It was part of a promise, conditioned upon our community’s behavior. We need to merit being in the land as a community of Jews. Somehow, the average Israeli has forgotten this message, and the ruling religious factions are happy to keep them in the dark. Israel’s survival depends upon more than secure borders and a strong defense. The larger community of Israel is being torn apart by a failure in shared ethics, by a disunity that is sweeping the Jewish community, and by a breach in our rich tradition of embracing diversity and pluralism of Jewish practice. The divide can be seen in our political arenas; it can be seen in the gaps between the generations and between the American and Israeli Jewish communities. Israeli Jewish identity is shaped, by and large, by a sense of belonging to the land. There are no “religious” choices that need to be made. There is no soccer on Shabbat; school is closed for the holidays; and everywhere you go you are reminded of your rich, deep rootedness in the land as a Jew. American Jewish identity is shaped by religious values that have to be exercised and chosen from among a long list of competing social values, Israel being only one of them. And there lies the disconnect. Jewish identity is controlled in Israel by those who deny us our Judaism, our very identity. We proudly send our children to serve in the IDF, only to discover that they have to fight a battle to preserve their Jewish identities, the ones we gave them. And we can’t afford the apathy, either here or in Israel, being created as a result of this disconnect. Israel, the seat of our ideals, has lost sight of and must reclaim its mission as the destination, the intention, the hope of all Jewish people. And we as American Jews must awaken to the issue, engage in the cause and assist in bolstering the “secular Israeli” Jewish community’s efforts to reclaim its historic Jewish identity. We can no longer tolerate a Jewish Agency–an Israeli establishment–that will send emissaries to teach us about Israel without knowing who we are as Jews, without learning from us and carrying our message back to Israel. For Israel to be the home of all Jewish people, all Jewish people need to feel at home in Israel. For centuries, our disunity has consistently led to expulsion, exile, and persecution. These events have almost always followed on the heels of schisms in our community that were the direct results of intolerance, a lack of empathy, one side’s claim of authority. For centuries, our unity has been based upon a multiplicity of approaches to Torah and to learning from others. Our rich tradition of arguing for the sake of heaven has helped us remain dynamic, adaptable, modern—a true light unto the nations. Torah has remained relevant because it has 70 faces. In the year ahead, we plan to deepen our connection to Israel: through our partnership with Masorti and with the Masorti community of Zichron Yakov; by participation in Rav Siach (“Multiple Conversations”), the first partnership between the Ministry for Jerusalem and Diaspora Affairs and the Masorti Movement in Israel designed to enhance the exchange of ideas; by hosting guest speakers who will educate on the topic of religious pluralism; and by supporting the Masorti movement in our missions and family trips to Israel. In so doing, perhaps “Israel” will come to a broader acceptance and embrace of the Jewish identity, of the role we play in ensuring the continuation of our rich history, and of the great empathy we are meant to carry as Jews who came out of Egypt together. Pass it on with love. In our monthly Family Service shtick back at the beginning of August, I packed a suitcase with tanning lotion and a tennis racket while Rabbi Scheff packed his siddur and a traveling Shabbat kit. The takeaway of our skit was that while we might go on vacation from work or school, we do not ever go on vacation from being Jewish. Jewish is what we are, not what we do. I find myself thinking of the playful skit now when Jon and I are on vacation in Budapest, Hungary, visiting Sarah and her fiancé Sagi. 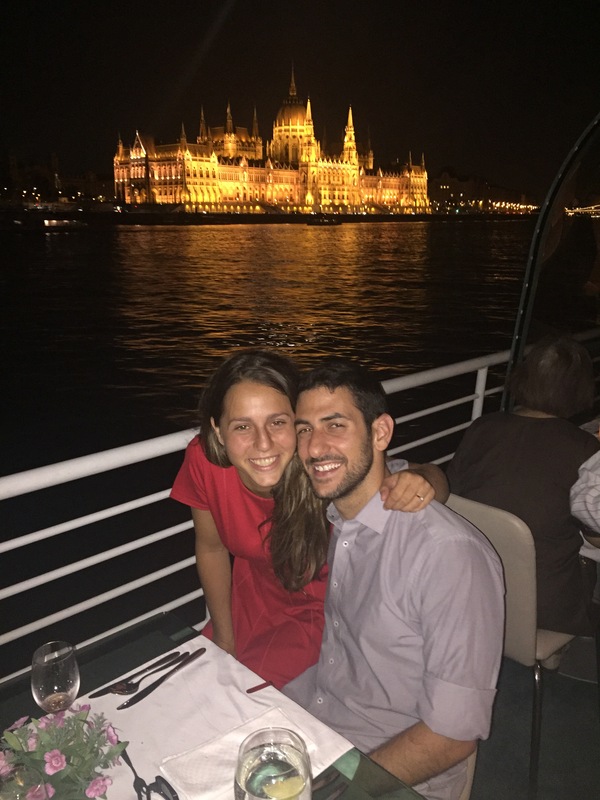 We are enjoying typical tourist experiences like visiting Buda Castle, cycling in the countryside, and taking a boat cruise on the Danube River. But identifying as a Jewish person is part of my vacation at every turn, and sometimes in surprising ways. There has been, of course, the very Jewish experience of being bageled. If you are Jewish and think that you’ve never been bageled, let me assure you that you have indeed been bageled. 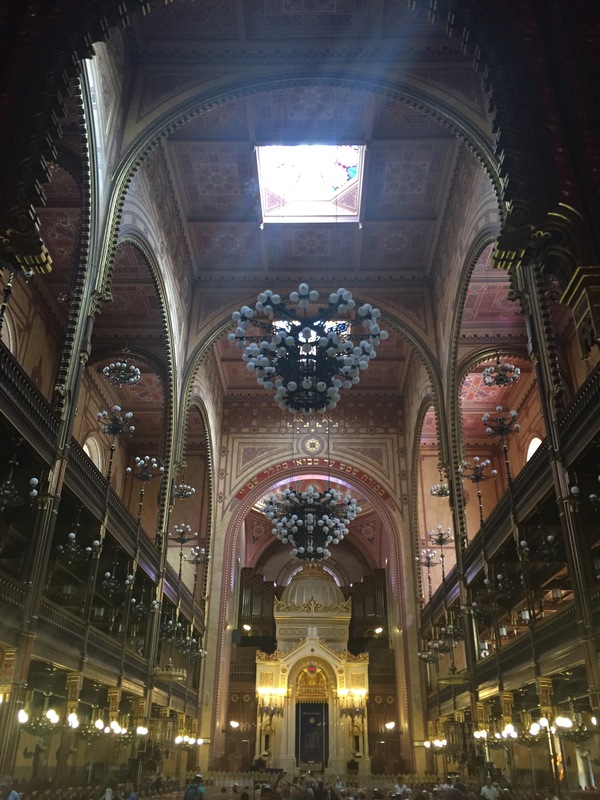 It goes like this: Nice research scientist from California on our Budapest bike tour asks, “What do you and your husband do?” I answer, “He’s a lawyer and I’m a rabbi.” “Oh,” he lights up. “My bar mitzvah was back in Englewood where I grew up!” When someone uses a funny non sequitur to let you know that he too is Jewish, that’s called getting bageled. In a more serious vein, being Jewish on vacation informs choices I make about places to see. 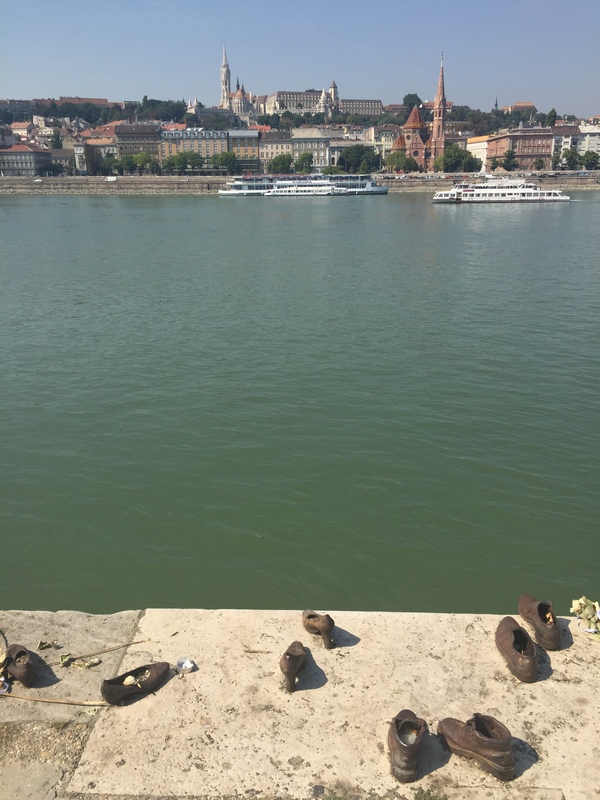 A walking tour of the Jewish Quarter, a lecture in the famous Dohany Synagogue, seeing the Wallenberg Memorial Weeping Willow sculpture and a solemn visit to the Shoe Sculpture on the Danube are obvious choices. Sometimes, I experience being Jewish on vacation in unexpected ways. 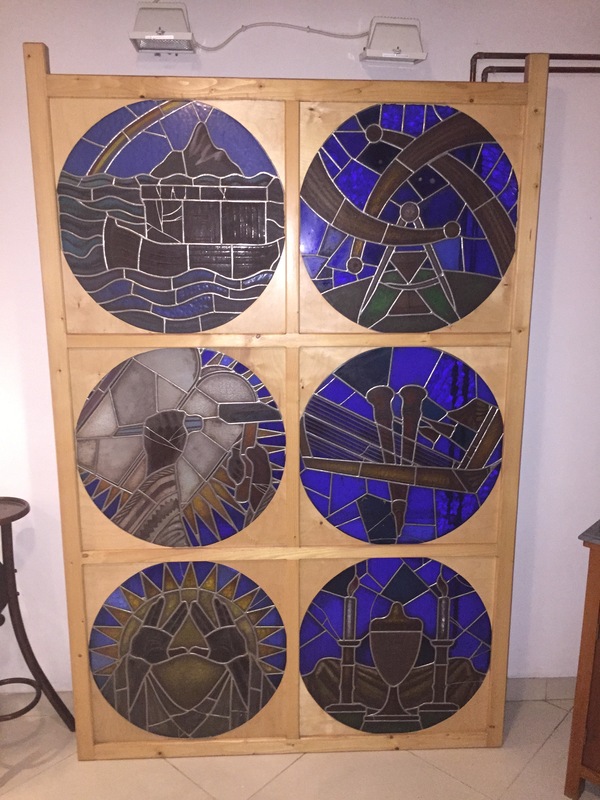 In the basement of the Art Nouveau Museum, featuring a collection of furniture, artwork and ornaments from the first half of the 20th Century, I stumbled across a strange wall of round stained glass windows and realized with a start that the symbols are all Jewish: Shabbat candles, the Ten Commandments, the High Priest’s hands. The curator tells me that these were windows found in a Budapest church. “In a synagogue, yes?” I encourage her, knowing that English is very difficult for most Hungarians. “No, a church.” She gestures with her hands to show me that they were high up on a wall, placed side by side. “Yes, in a Jewish church,” I try to explain. Her eyes light up with understanding, “Yes, Israel. 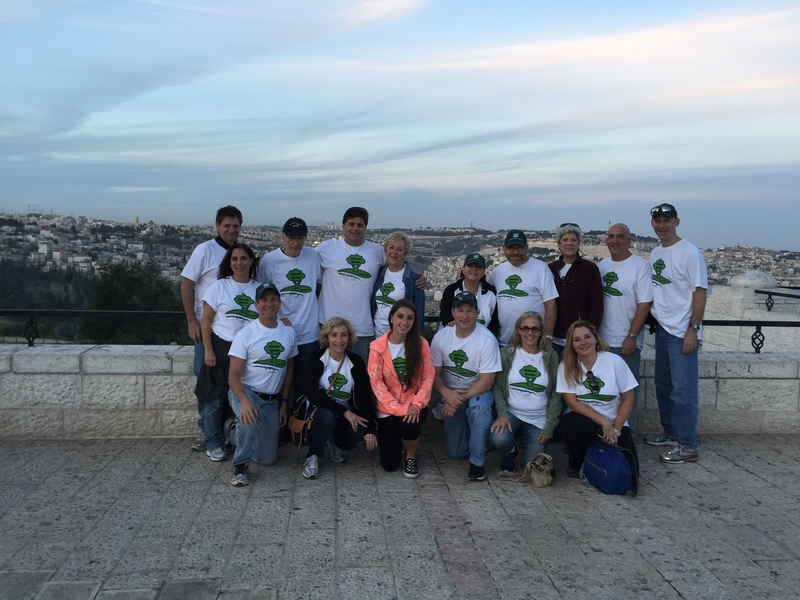 Church for Israel.” After our visit, Jon gave voice to what I had been thinking. “How much of all that furniture and artwork was stolen from Jewish homes during WWII?” It was a chilling thought. It was probably a correct thought. And it is a thought that occurs when Jewish is what you are, not just what you do. Such are the thoughts you think when you travel Jewish. Traveling Jewish means that the tempo of vacation shifts a bit on Friday. Turning down several streets in the Jewish Quarter, we at last find the kosher market where we buy two challot (and Israeli Bamba for Sagi) to take with us to Siofok on Lake Balaton. 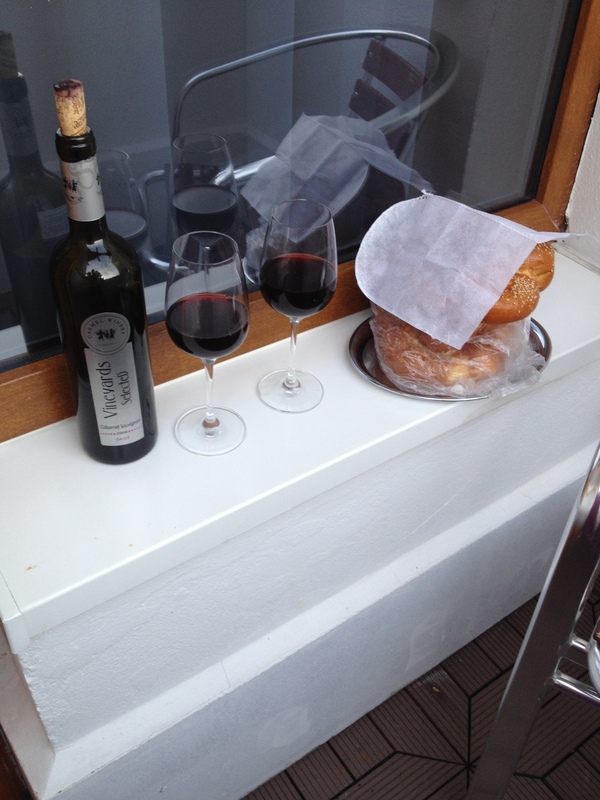 As we exit, two old men playing chess by the door look up and smile, “Shabbat shalom.” I smile with warmth, “Shabbat shalom to you.” Later we make Shabbat on the terrace of our hotel room. Sarah and I light Shabbat candles together and Jon and I bless her and Sagi. Such are the special moments of traveling Jewish. After dinner, Sagi showed us a map of the town of Siofok with a Jewish star and the word zsinagoga. We walked into town, past pubs and cafes, down a dark side street to a small, carefully maintained synagogue. 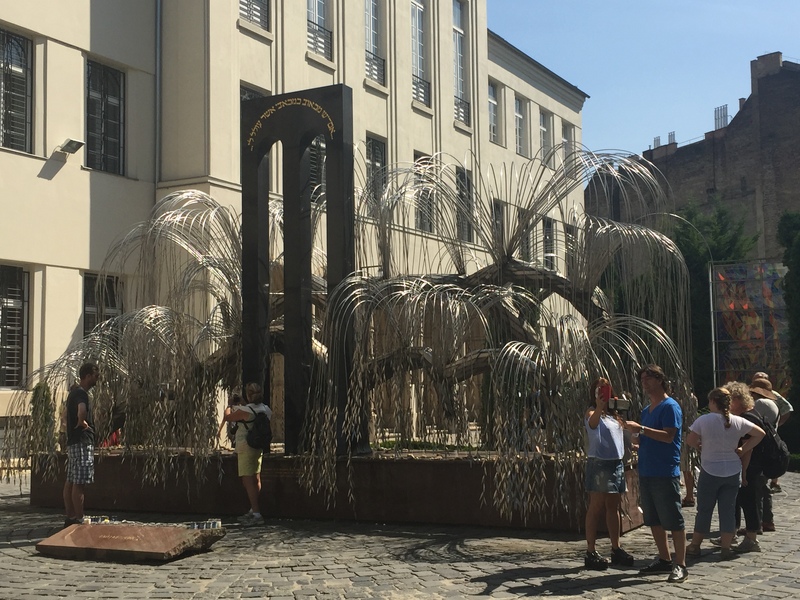 In the front of the building, we found a Holocaust memorial in the shape of an angelic harp with train tracks below. A plaque stated that it was donated by Tom Lantos, the Hungarian Holocaust survivor who went on to become a California Senator and a champion of human rights. Walking back to our hotel, we wondered how the Nazis managed a sweep of tiny, out of the way towns all over Europe. On this past Shabbat evening, without intending to do so, we paid tribute to the tragic history of the Jewish people in the 1940s. 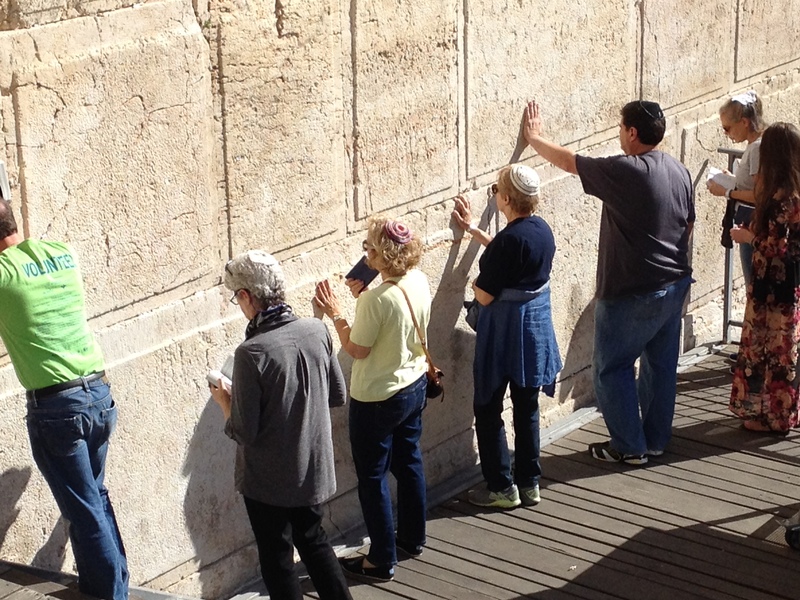 We were hushed by the power of the place and the power of the moment — such are the powerful moments of traveling Jewish. I look forward to greeting my OJC community before Rosh HaShana when I return from traveling Jewish!